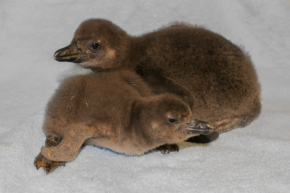 African penguins: We’ve had three hatch this spring! 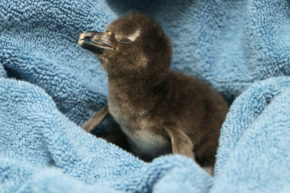 Jakada (male) hatched Feb. 26, Zebib (female) on March 5, and another on April 24 (still hasn’t been named yet). You may have seen Jakada’s and Zebib’s first swim recently. We’re now giving them pool time in their habitats for brief periods in the day, and will continue introducing them to the rest of the flock. Stop by their pool in the Wilds of Africa to catch a glimpse of these adorable chicks! (Our last chick to hatch will join the flock in the pool in late July). Jakada and Zebib shortly after their hatchings. 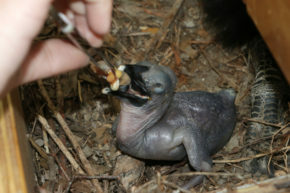 The April 24 chick after its hatching. King vulture: Hatched on April 3, this chick is melting hearts in its ZooNorth Wings of Wonder habitat. The little one will eventually develop a very colorful neck and head with varying colors, including yellow, orange, blue, purple, and red. 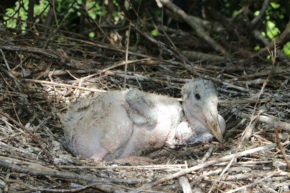 Yellow-billed storks: We hatched six of these chicks this season. This group is currently behind the scenes, but will most likely be in their habitat soon. 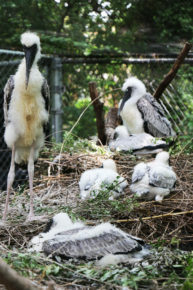 These storks are a particularly big deal for us because we’re the only AZA-accredited zoo hatching them right now. 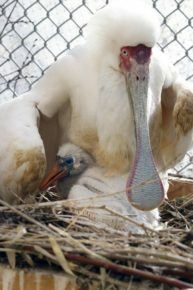 Marabou storks: Two of these chicks hatched this season, one on Jan. 30 and one on May 6. The first chick is in its habitat on the Gorilla Trail, and our second chick remains behind the scenes. We’re proud to care for one of the largest flocks of marabou stock in North America! 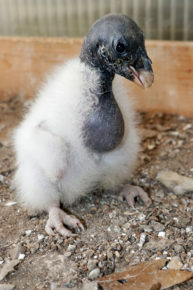 Hooded vulture: Hatched on May 16, this chick is currently on habitat in Wings of Wonder. Our other chick hatched May 22 and is in the saddle-billed stork habitat near Simmons Hippo Outpost. Check out the live-streaming “nestcam” video near the habitat to see this chick! Hatching season still isn’t done! We still have more to share, including some hatchlings that are a first for us. Stay posted for more! 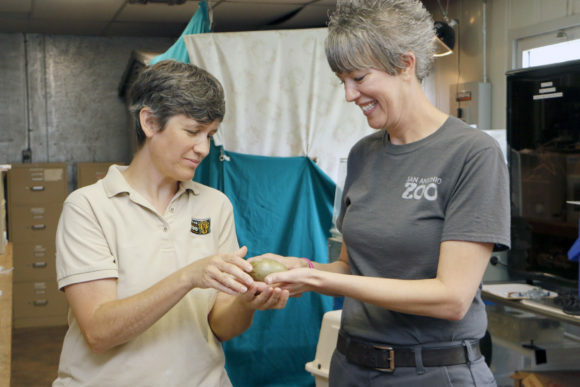 Dallas Zoo Assistant Supervisor Marcie Herry gives San Antonio Zoo Senior Keeper Serenity Hyland one of two kori bustard eggs to be raised by the San Antonio Zoo. What does it take to ensure the survival of a genetically valuable bird? Sometimes it means flying halfway across the country to pick up an egg and bring it back to Dallas to be fostered by a different set of parents. That was the case this spring bird season when a lappet-faced vulture egg was laid by a mom at Disney’s Animal Kingdom in Florida. The mom, unfortunately, didn’t have the best track record caring for her young. Luckily, the Dallas Zoo has a great set of lappet-faced vulture parents that could act as foster parents—yes, there are foster parents even in the animal kingdom! Fostering like this and even hand-rearing are options that Association of Zoos & Aquariums institutions have to consider for new births or hatchings to conserve and save wildlife. 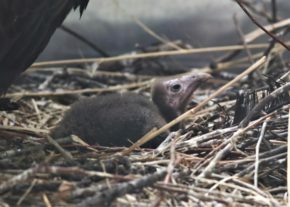 The lappet-faced vulture hatching is just one example of the decisions the Dallas Zoo deals with every spring with 700-plus birds on grounds, spanning more than 100 different species—many of which are endangered, declining, or near threatened. When the parents aren’t available, sometimes zookeepers step in as the foster parents, like with a new kori bustard hatchling this spring. 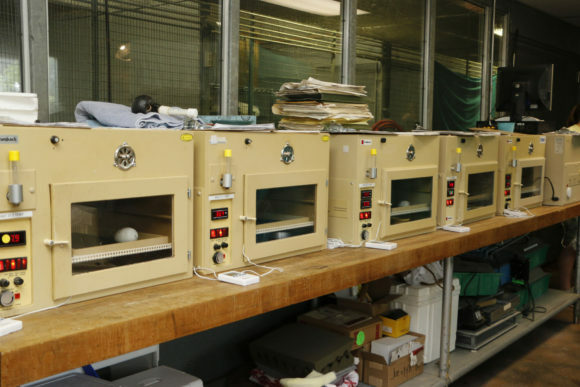 We’re hand-rearing one of these, and another two kori bustard eggs were picked up by the San Antonio Zoo, where they have the space and manpower to raise these chicks. In other instances, zoos even cross-foster between similar species if the same species is not an option. For example, a lappet-faced vulture chick may be reared by a white-backed vulture and vice versa. This is done very carefully, and only in the right circumstances. Regardless of what it takes to ensure a chick’s survival, the Dallas Zoo and other AZA-accredited zoos are doing everything it takes—from hand-rearing to fostering internally or even delivering eggs and chicks to zoos hundreds of miles away—to save animals from extinction. The next time you peer out into the flamingo pond and see a unique species of bird, remember—it might have been raised by mom and dad, or it may have taken a different path, like being raised by humans, foster parents, or even a different species altogether. 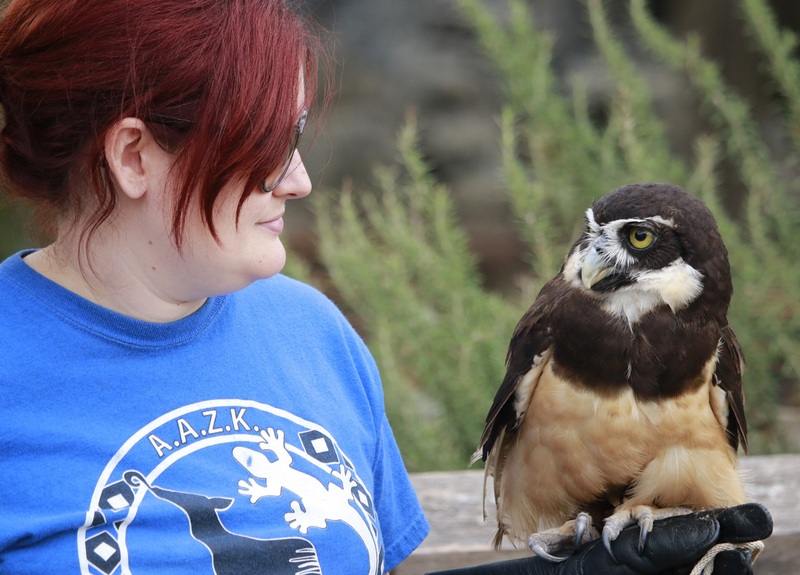 Bird keeper Eric Lutomski guest blogs on ZooHoo! Everyone knows birds build nests, but not everyone realizes just how many different kinds of nests there are! Nests can be as small as a teacup or as large as a dinner table and can be plainly out in the open or carefully hidden away. 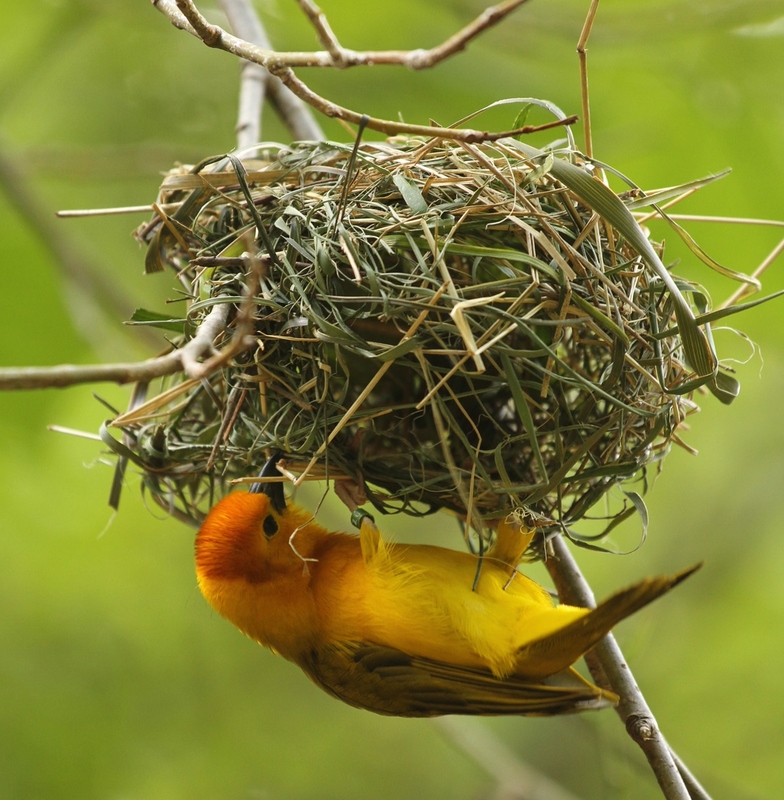 Nests are constructed from all sorts of materials like carefully woven fibers or large tree limbs. Sometimes birds use even unusual materials, like saliva for glue or spider webs for camouflage. Many birds don’t make nests out of anything at all—their eggs are instead laid in burrows underground, inside a hollow tree or log, or even on a well-shaped ledge of rock. Here at the Dallas Zoo, letting birds build their nests is a very enriching and stimulating experience. It lets the birds perform their natural behaviors like location selection, material gathering, and nest construction. 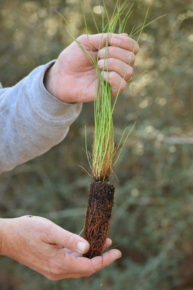 In many species, building the nest is part of courtship between males and females and is important for breeding success. Ideally, all birds at the Zoo would be able to build their own nest, but sometimes they get a bit of help from the zookeepers. 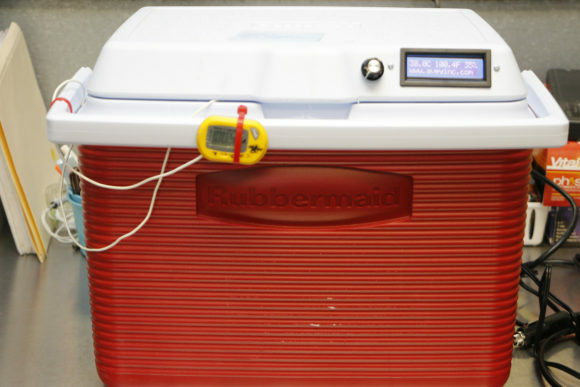 It can be anything from extra grass or sticks to mesh platforms for support structures. We want to ensure that eggs or chicks don’t fall out of the nests. 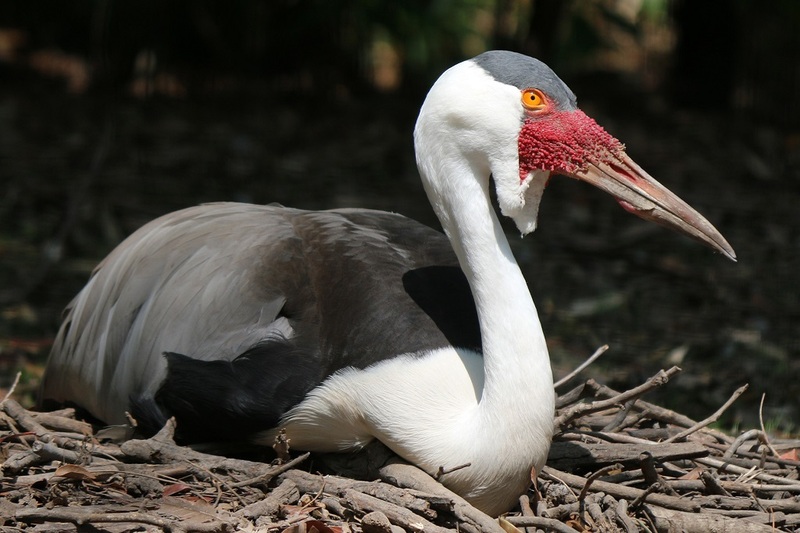 Large birds like vultures, eagles and storks don’t like to nest on the ground, so keepers provide them with elevated platforms and lots of sticks of many shapes and sizes that the birds can weave together to form their nests. Songbirds and other small birds, like jays and pigeons, prefer their nests to be bowl shaped. Many birds like hornbills, lorikeets and cranes nest in tree cavities or other secluded locations like burrows or tall grasses, so keepers provide boxes for them so they can nest in privacy. Jeremy Proffitt, manager of applied behavior and animal welfare, guest blogs on ZooHoo! Tulum is a special bird that much of the public has never met, but not for long. 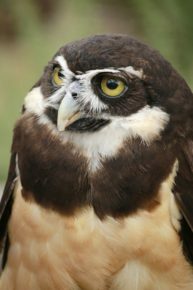 This spectacled owl is proof that it’s never too late to learn because she’s one of the Zoo’s newest ambassador animals meeting guests in the park. Tulum is a healthy 25-year-old that’s unable to fly due to an injury as a young owl. In the past, she was skittish around people and the equipment used to handle her. 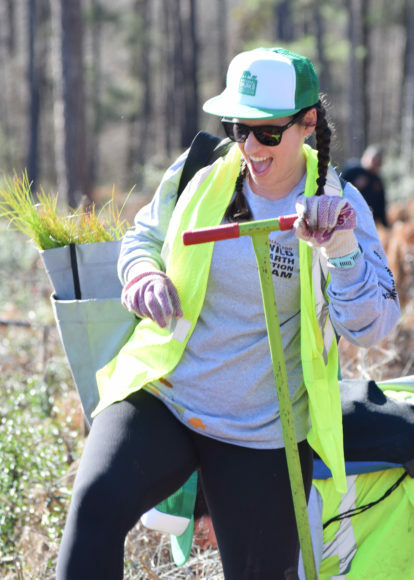 A new behavior plan was developed to build her comfortability with people and confidence in her surroundings. Keeper Amanda Barr started the process months ago getting Tulum comfortable around her. Amanda’s calm demeanor and patience benefitted Tulum, even in the early days of working together. Amanda transferred to another section and bird keeper Alex Gilly soon took on the project with open arms. She worked patiently and diligently building a trusting relationship with Tulum that would be paramount to the rest of the training. With a trusting relationship established, Alex worked daily to introduce the glove, touch Tulum with it, and offer her food from it. Eventually Tulum was asked to stand on the glove, which would allow her to be carried into the park. Keeper Alex Gilly and owl Tulum have formed a special relationship. Alex’s next big step was walking Tulum out of her behind-the-scenes home. The training plan and relationship the keepers built shined through and allowed Tulum to see more of her world. You might see her out-and-about near Wings of Wonder educating guests. Stop by and say hello! Tulum’s interactions in the park are short right now, but they will become longer as this remarkable bird becomes more comfortable. 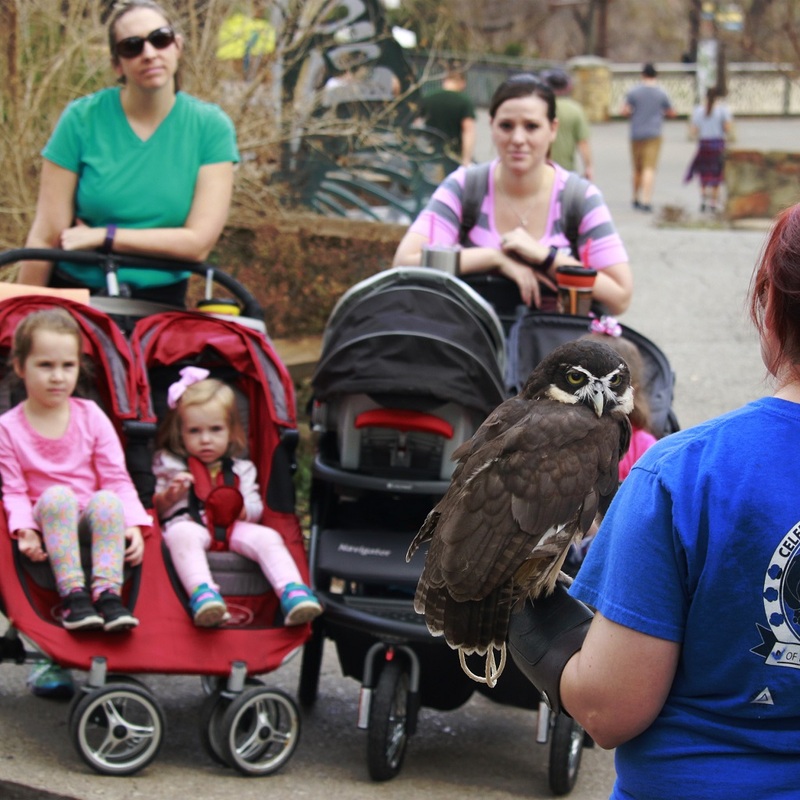 Thanks to patient keepers and a special behavior plan, this great little owl gets to broaden her world, and guests get to meet an amazing animal. The Dallas Zoo has a new little ambassador and she’s ready to meet her world.